When a fellow breeder fell seriously ill and was unable to care for his Gouldians, he asked me to care for them. I remembered back several years when I first saw his birds; the only word that came to mind at the time was “radiant.” His birds literally glowed. I purchased several of them and was quite pleased with their size and offspring. So when he called and said he needed to sell his birds, I jumped at the opportunity. Upon entering his bird room I felt like I had entered the ‘twilight zone'. 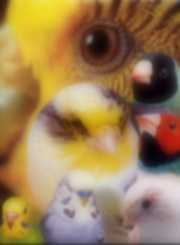 What had once been the best looking Lady Gouldian Finches that I had ever seen were now balding, dull, lifeless birds. But I must say, that I completely understood what the problem was because I know how many hours I have spent caring for my own birds. It takes constant, non-stop attention to nutrition and hygiene. I can only imagine what all that work would be like if I was having severe health problems…non-existent! I purchased these birds because I knew that almost all of his breeders were excellent "parent raisers." 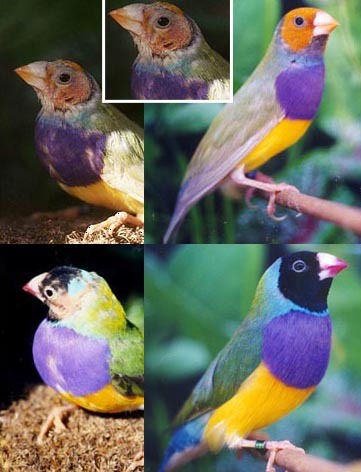 That is, the parent Gouldians raised their own offspring and were not dependent on Society Finches as foster parents. I was now the proud owner of bald, rumpled, lethargic, sad Lady Gouldian finches. I had adults, juveniles, babies and even a few fertile eggs. I was sure that I could turn these birds back into what they once had been. 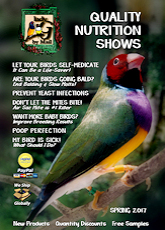 I considered my own birds to be in outstanding condition.I realized I had the "perfect" opportunity to test the supplements which I used on my birds on the neglected Gouldians. I knew the products were excellent and now I had a chance to prove it. I documented the program step by step, including photographs. I wanted you to be able to see what I saw as the weeks progressed. The following is an account of the steps that were taken to save as many of these neglected Gouldians as possible. In order to keep accurate visual records on the project, I selected three of the adults and two babies to photograph throughout the project period. Problem No.1 – Refusing to Eat "Soft Foods"
The biggest problem that I faced was that most of the Goulds would not eat “soft food” that would supply them with the nutrition they needed to bring them back into condition. To overcome this, I placed a supplement in their drinking water. Hearty Bird, it is a vitamin/mineral supplement, added to the drinking water of birds that will not eat a soft food mixture. As the photos will illustrate, many of the birds were stuck in the middle of the molt and some were even featherless. Their requirement for protein and amino acids during this stressful period was very high. Feather Fast which contains multi-vitamins, minerals, amino acids and proteins specially designed for molting and feather plucking birds was added to the diet. Feather Fast can also be administered on "“soft food". Since many of the birds would not eat the soft food, I sprinkled the Feather Fast onto Sprouted Spray Millet. Gouldians absolutely love spray millet. Due to the over breeding state of the female Gouldians, the final supplement added to their diet was Calcium. I believe that calcium deficiency is THE single nutritional problem from which most female Gouldians die. For more information on the need for Calcium in your birds diet, read the Eggbinding and Diet features on the site. I have always been very reluctant to add ANYTHING to the water source of my birds, other than medication when necessary, for fear of contaminates. Since medications are re-mixed daily, most unwanted growth is prevented. Therefore, to reduce the danger of contamination when putting supplements in the drinking water, I added Sparkle. It is a water cleanser that prevents the multiplication of bacteria, yeast, algae and fungus in the birds drinking water with out harming the beneficial bacteria that occurs in the healthy avian gut. With the use of Sparkle I am willing to add the vitamin/mineral and calcium supplements to my birds' water source and not worry about the growth of harmful bacteria. I have never used supplements that have demonstrated such quick visual results. Normally it takes 8 to 12 weeks for most birds to complete their molt. This was accomplished in some cases in less than six weeks with the help of the supplements. They dropped more feathers more quickly allowing them to go through their molt within weeks! I couldn't believe what I was seeing. I was unable to save all the rescued Gouldians. Many had never received the proper nutrition from birth and were too weak to be saved. Several juveniles and adults were so malnourished it was impossible even for the new supplements to save them. I realize that this article may sound like a commercial for supplements. It was not meant to be. 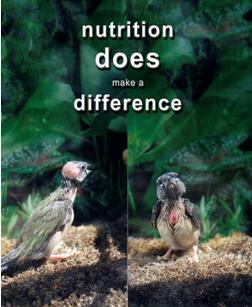 I have just been so amazed and pleased by the results using supplements on these poor neglected birds. I really wanted to get the word out. 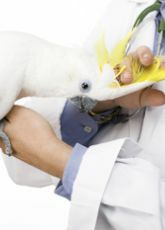 I have come to realize that I am reaching a large number of pet and exotic bird owners from around the world. I just wanted to share the results. I would hate to think that there are birds out there wasting away from the lack of a proper diet when it isn't necessary. The use of quality supplements in combination supplied these malnourished birds with the necessary nutrition to save their lives. ... taken over a six week period. In order to keep accurate visual records on the project, I selected three of the adults and two babies to photograph throughout the project period. When the birds arrived at my aviary, they were totally lethargic. They did not stand on the perches they “sat” on them or they sat on the floor of the cage. They only moved occasionally to drink and eat. They were very easy to photograph.